The 2017 German federal election is in the books and it brought tectonic changes to a political system that has seen remarkable stability. 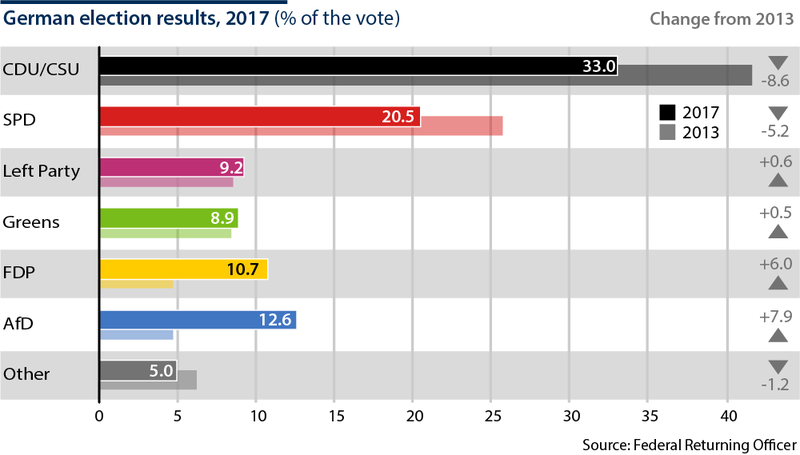 While Chancellor Angela Merkel and her conservative CDU/CSU technically won the election and the Social Democrats (SPD), led by Martin Schulz remain the second strongest party, yesterday’s result might prove to be the ending point for the idea of the Volksparteien. The two defining parties in German post-war history, partners in a left-leaning Grand Coalition for eight of the past twelve years, had voters running away in droves. The CDU/CSU received 33 percent, a virtual all-time low. The SPD received 20.5 percent, also an all-time low. The combined total is a far cry of the past, even less than that of the 2009 election at the height of the financial crisis. The reasons are plentiful, but above all is a feeling of misrepresentation by a large share of the German people. Public dispute over political issues under the reign of the Grand Coalition was subdued. Decisions were made within the closed circles of both parties and presented as inevitabilities. Marginalised in parliament, the opposition of the Greens and Socialist Left could not keep the left leaning government in check. Meanwhile, the right side of the political spectrum was woefully unattended. This election will definitely change the latter. In comes the Alternative fuer Deutschland (AfD), oscillating politically somewhere between national-conservative and fully nationalist. Led by former conservatives, but very open to radical right-wing activists, the party is a classical protest party and appears to be in disarray from day one. Frauke Petry, currently Chairwoman of the party, has already declared that she will not join the AfD parliamentary group, but rather become an independent MP. Their success in the popular vote, however, is particularly damaging for Angela Merkel. 20 percent of AfD voters previously voted CDU/CSU. Most of them switched explicitly because of Merkel and her refugee policy. All of that leaves Angela Merkel in a very precarious situation: She is lacking options to form a government. The Social Democrats only minutes after first exit poll results came in stated they would head to the opposition. That leaves her with only a single realistic option, a coalition with the Greens and the FPD. How they fit together is a complete unknown, even assuming good will among all parties. The liberal FDP is just returning after being ousted in the previous election. It is decidedly pro-business and will fit with the economically conservative part of the electorate. Christian Linder, its charismatic young leader, is a serious candidate to become Minister of Finance. He would most likely increase domestic spending, but is a strong opponent of increased solidarity within the Eurozone. Other issues that the FDP will focus on are education and digitalisation. The Greens had a stronger result than expected and could complicate matters on climate and environment protection, particularly given the situation of the German car industry. The Greens control a lot of the vote in the Bundesrat, the German parliament’s second chamber, which could make governing easier for the coalition. Chancellor Merkel is also burdened with a Bavarian sister party, the CSU, that faces a regional election next year. The CSU lost a higher share of votes compared to the CDU and is expected to make a sharp turn to the right. All of this will result in some very extended coalition negotiations, which will see additional delay due to an election in the state of Lower Saxony in October. A government being formed before early December would be very surprising. For Europe and the pending Brexit negotiations, this could spell trouble. Conflict over Emmanuel Macron’s reform plans for the EU is very much on the horizon already. European integration will be a contested issue, particularly ideas of a Eurozone budget. Any hope that Germany could push the EU Commission to be more sensible towards British interests in the negotiations seemed far-fetched anyway. All political parties agree on a strategy that values the integrity of the single European market over short term financial gain through an amicable Brexit deal. Any new government is unlikely to give Brexit a high priority or even result in a policy change.